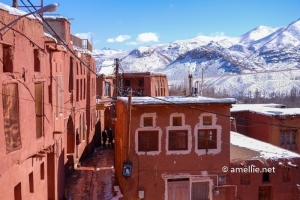 Abyaneh is one of the oldest villages in Iran. It is known to have existed 2,500 years ago. Situated on the north-western slope of Mount Karkas between Kashan and Esfahan, this ancient village is a living museum of Iran, preserved for its cultural heritage, traditions, and unique beauty despite centuries of changing rules, dynasties, and kingdoms in Persia. 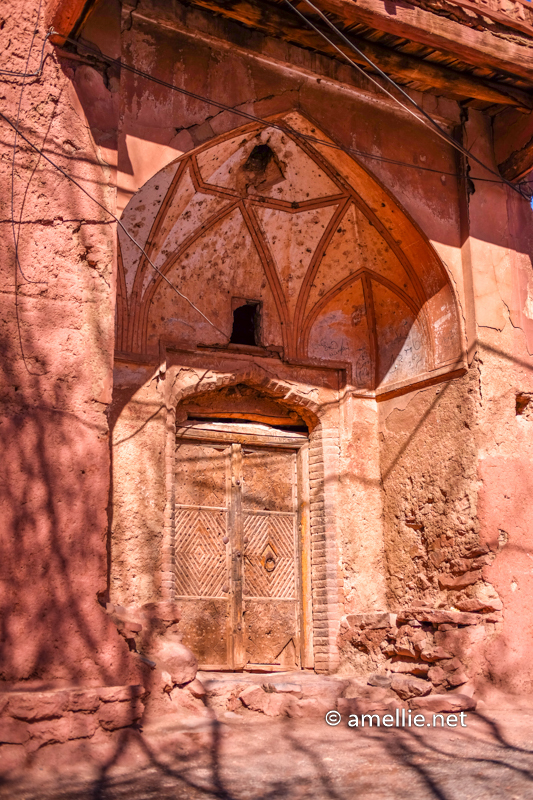 The oldest building in Abyaneh, Harpak Zoroastrian Fire Temple, was a true testament to the existence, growth, and advancement of the once-isolated village and its people. Built during the Achaemenid period (550-330 BC), the fire temple used to be an important religious temple for its majority Zoroastrian inhabitants, until Islam was fully embraced by the locals after the arrival of the religion in the country. The picturesque village is surrounded by mountains and guarded by three forts, that have been long abandoned. 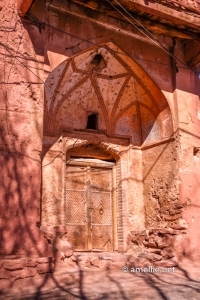 The Palahamoona Fort (Takht-e-Haman) is believed to have been built over 200 years ago and is situated in the south-west of Abyaneh, across the Barzrud River. If you know your way around, you will be able to walk towards this fort and see the spectacular panorama of the village with its beautiful mountain backdrop. I love walking through endless twisting alleys of Abyaneh, gazing at beautiful multi-story houses made of red clay. 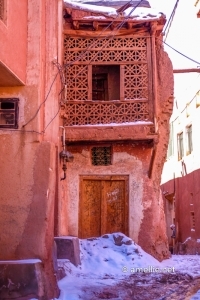 Wooden windows of different sizes carved with geometric designs decorated these buildings, which sit on top of sloped lanes. 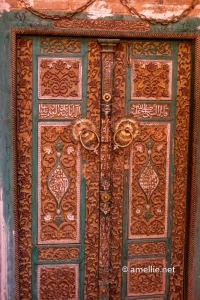 Wooden doors are carved with Quranic verses elaborated with unique door knockers. 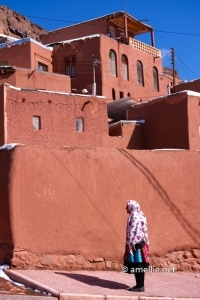 Occasionally, I saw a few women of Abyaneh, adorning their traditional floral white hijab (head covering) and pleated skirts, walking around the serene village. 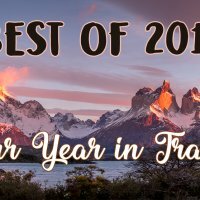 Due to its dwindling population, most of the 300 (or more) inhabitants are old as the young would go to big cities in search for better opportunities. It is hard to believe this, but the last baby in this village was born 11 years ago. Get lost in the village! 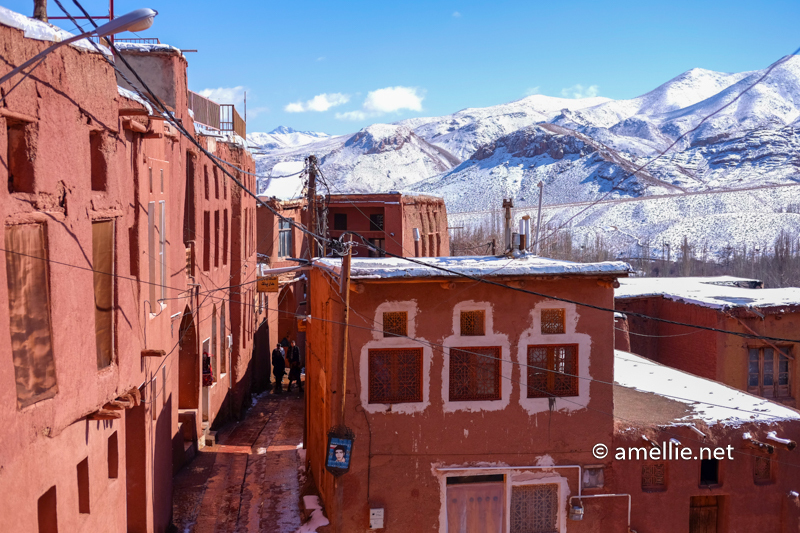 Abyaneh can only be discovered by foot, hence the only advice I could give is to get lost in this small village and take the less-explored alleys. 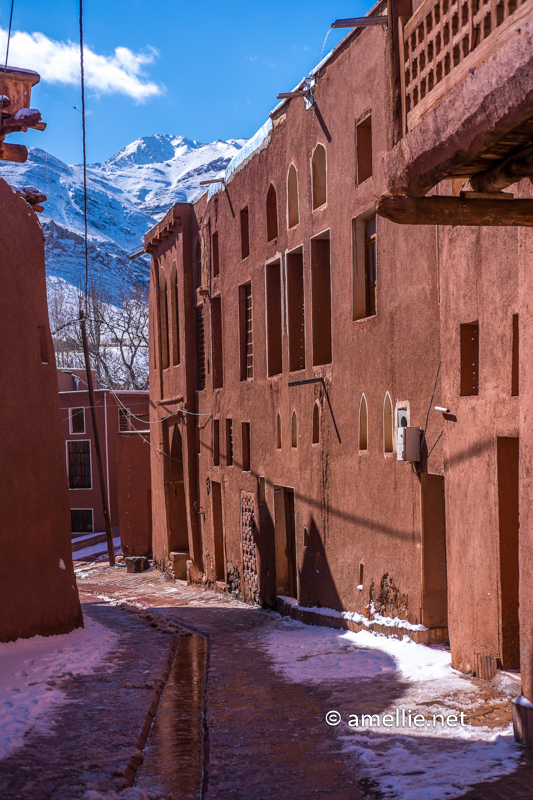 I would do exactly that if I skipped Kashan and came here straight away so that I would have more time and freedom to discover the other parts of the village. 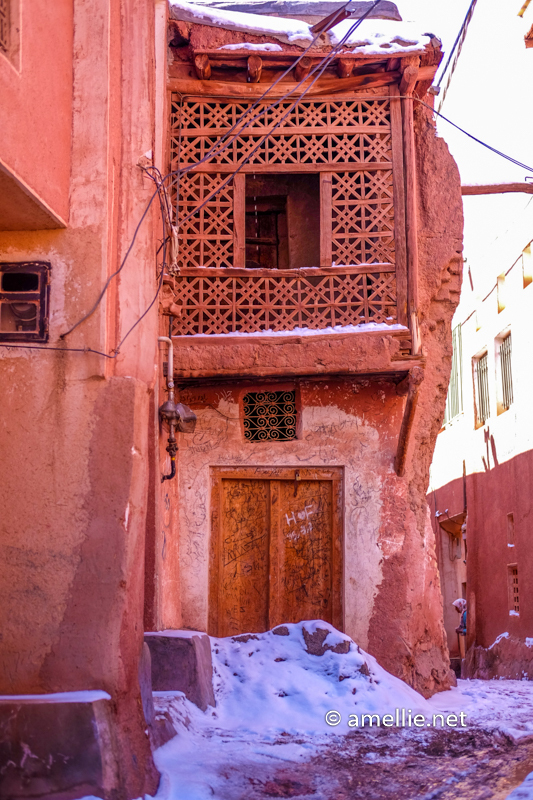 Every section of Abyaneh is picturesque. I was told that it snowed the night before we arrived here. The snow that covered some parts of the village made it even more beautiful. 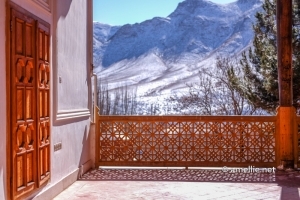 Some houses have stairs to go to the rooftop, allowing us to see the beautiful scenery and the mountains surrounding the village from the rooftop of a building. To get the perfect scenic view of Abyaneh, we had to walk for 10-15 minutes, crossing the Barzrud River, towards the Palahamoona Castle in the south-west of the village. We were lucky to have our guide, Alians, who knew how to get to this spectacular place, as I didn’t see any other tourists going there. This is my most favourite place in Abyaneh. It’s just SOO beautiful! Everything was perfect when we were there. The sun was out. The sky was blue. 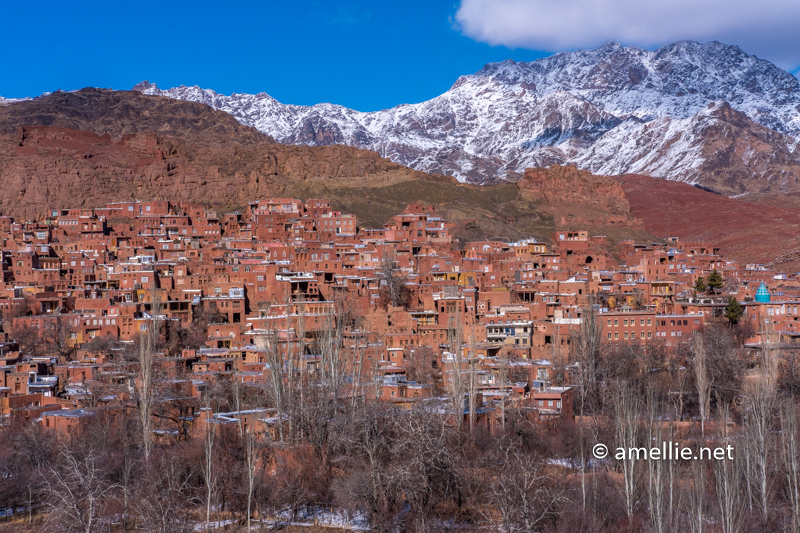 The snow-capped mountain was a perfect backdrop for this red village. We were there at the right time! 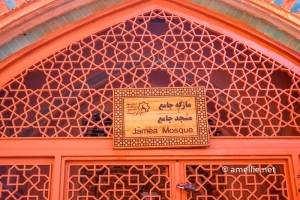 The Jame Mosque is one of the few mosques that can be found here, in Abyaneh. It’s the main one. 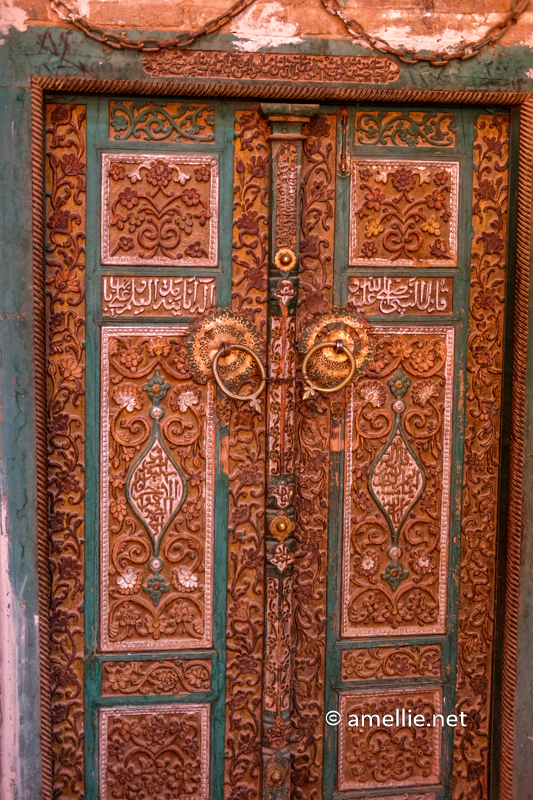 The wooden mihrab (pulpit), which has a Kufic script carving, dates back to the Seljuq era (1074 AD). Unfortunately, we were not able to enter the mosque when we were there as it was closed. When the mosque is opened for public, it is possible to go inside and see the beautifully carved mihrab, minbar (altar), and ceilings. 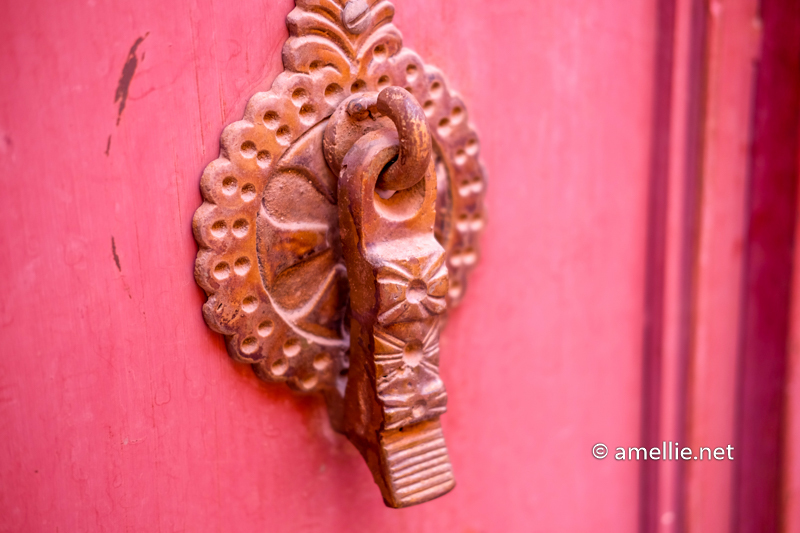 The Door Knockers – Who’s Knocking? 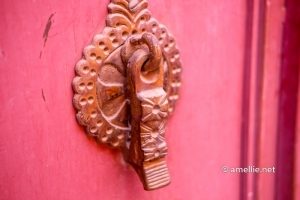 One of the most striking designs of most ancient wooden doors in Iran is the door knockers. Each house or gate usually features a pair of doors, which are equipped with a pair of door knockers that have two distinct designs. One of the door knockers has a long shape, while the other one has a round shape. What’s the difference, you may wonder? Well, there is an interesting story behind this! Traditionally, the round shaped door knockers are strictly for female use, while the long shaped door knockers are for male use. 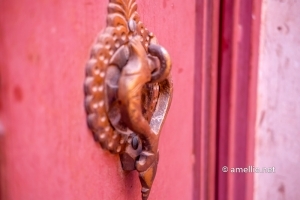 These two door knockers have distinct sounds, which provides clues to the house owner whether a male or a female knocks the door. A male house owner answers the door if the caller is a male and vice versa. If there are no men in the house, then the woman can wear a hijab if a male is behind that door. Interesting isn’t it?! Unfortunately, there are no public buses that go to Abyaneh. The only option to visit this village is by car. 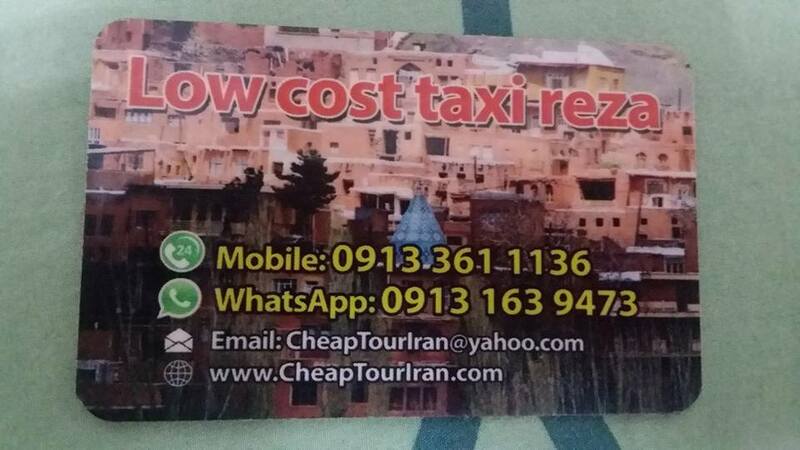 You can either take a combination of a bus and a taxi, take a taxi from Kashan or Esfahan or book a private tour. 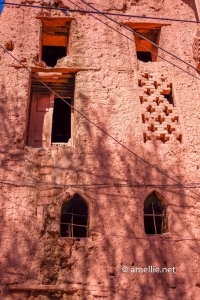 The majority of tourists would visit Abyaneh as a day trip on their way to another destination. They either come from the direction of Tehran/Kashan on the way to Esfahan or from the direction of Esfahan on the way to Kashan/Tehran. 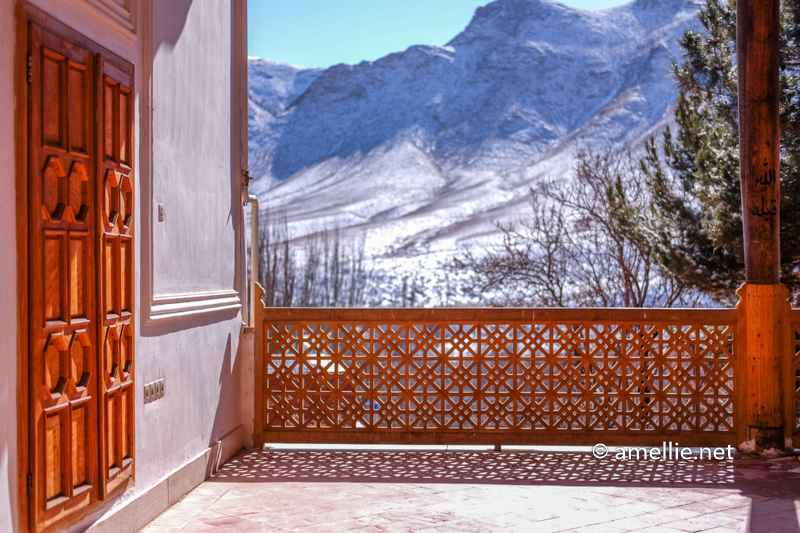 However, if you feel like you wanna spend a night in this quiet village, then it is possible to stay at one of the hotels in Abyaneh. 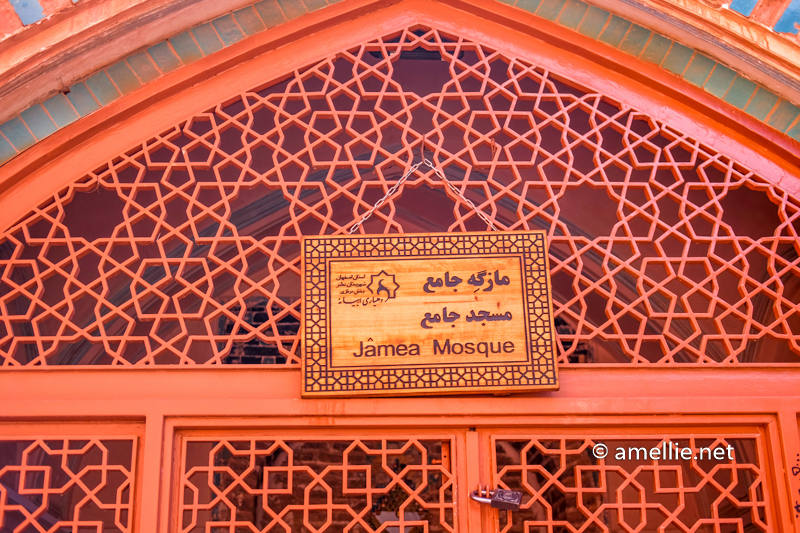 The cheapest way to go to Abyaneh is to take a bus to Natanz or a shared taxi (for less than 75,000 rials or USD 2.5) from the city of Kashan. Ask the bus/taxi driver to drop you off at the intersection of Abyaneh. From here, you can stop any cars and pay roughly the same price (USD 2.5) to go to Abyaneh. If you are in a hurry, taking a taxi or a private guided tour is way better. 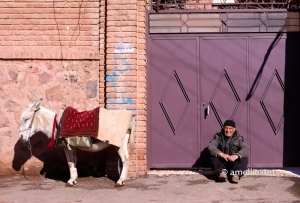 A lot of travellers hire a taxi from Kashan to go to Abyaneh. The price ranges from as cheap as USD 20 to 40, depending on how good you bargain the price. When taking a taxi, make sure to agree in advance on how long you will be exploring the village. Travellers often complain that their taxi drivers would tell them to come back within one hour – which is way too short for exploring the village. Three hours is a minimum and if you are intending to take lots of pictures, then it may take longer. 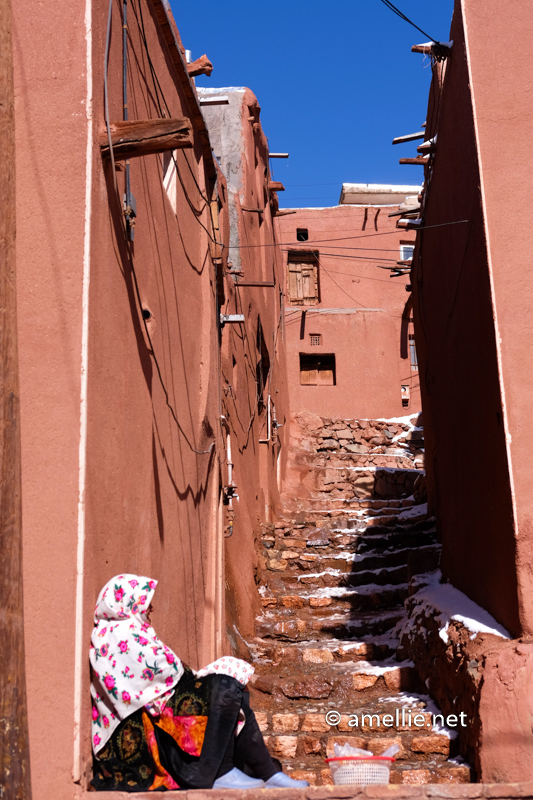 The best thing about joining a private tour is that your tour guide will show you the way around the village and lead you to a hill where you can see a beautiful panorama of Abyaneh. You can also be a bit more flexible when it comes to the time, so ensure that you discuss this in advance. The guided tour costs about USD 45 to 50 per car, which includes a tour of the Fin Garden in Kashan and Abyaneh. We contacted Alians, our guide for this tour. He was a nice guide. He picked us up in Kashan and dropped us off in Esfahan for the same price. 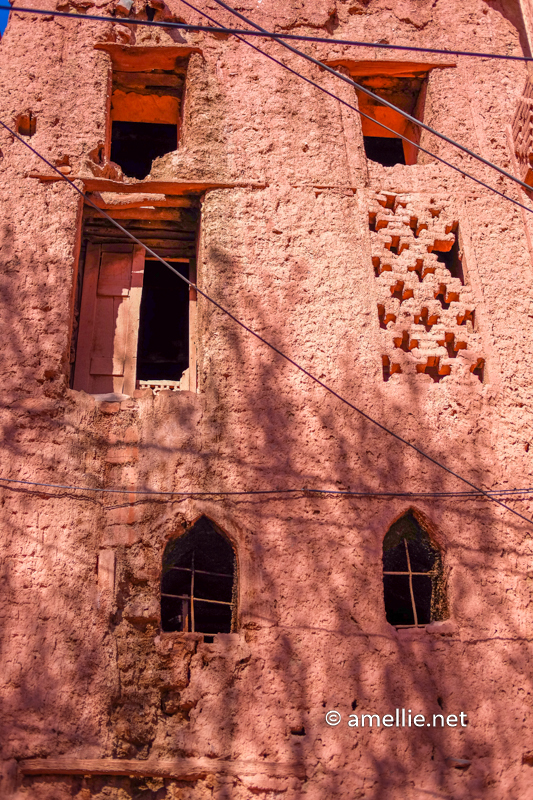 The ticket costs 50,000 rials to enter the Abyaneh village. A small booklet of Abyaneh complete with a map will be given to you along with the ticket. 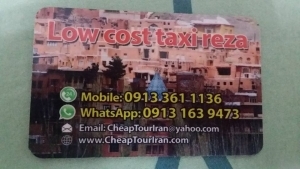 The guided tour costs USD 50 per car, which includes a visit to the Fin Garden in Kashan (which I would not recommend), tour around Abyaneh, and a transfer to Esfahan. The guide can either pick you up in Kashan or Esfahan, with the same price. You can share the cost with 3 other people. 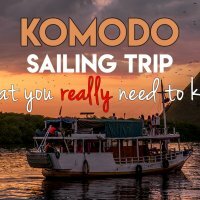 Awesome blog, really great tips. Thank you !